-09 Buell XB12Scg - GOT IT FOR HALF PRICE! Don't laugh. That's what one of our guys in houston had to do to get his Miata and Elise in the garage. Sorry, no pic for that one. That's brilliant - you'd want to make sure you parked in exactly the right spot on the lift though!! No kidding. A little bit off on the parking and crunch. 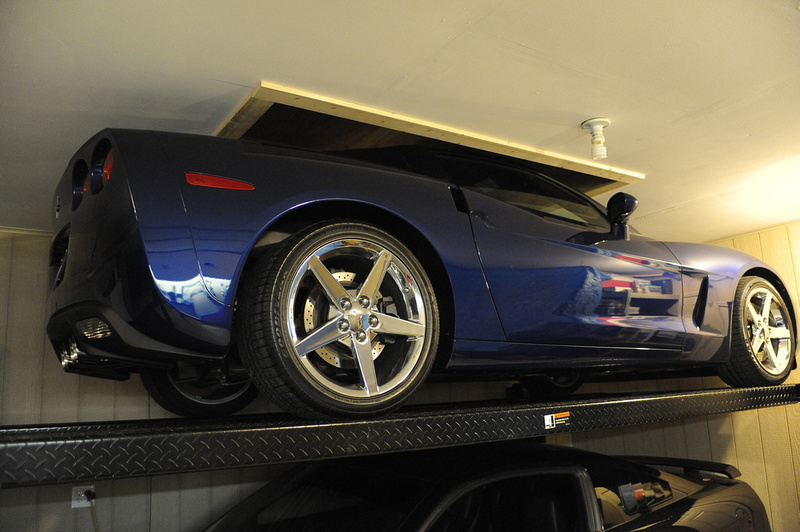 I was house hunting a couple of weekends ago and taking special note of how high the garage ceilings were. You sir have just added some good ideas to the mix! That's a cool idea, but take it slow if your ceiling is attached to the bottom chord of a web truss and/or your garage roof is subject to heavy snow or wind loads. Then you'll want some advice from a qualified structural engineer before having at it with a sawzall. You'll need a very large laminated beam boxed in with a lot of very good attaching points, but it can be done! Too bad I have a bedroom above my garage. Hmm. Time to add a skylight in the bedroom floor? Could've had a Callaway conversion.